After a busy spell in the workshop it is now time to do some de-cluttering and have a bit of a spring clean. I wonder what treasures I will find? Meanwhile at the bench I have a wedding ring to complete. My customer came with a specific idea and it is always good to turn someone’s notions into reality. This piece will be in yellow and white gold which I am looking forward to working. 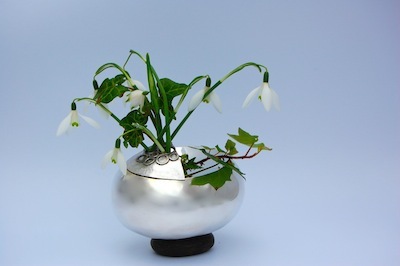 On the silversmithing front I am turning my mind to containers for flowers….it must be spring.